CHAMPAIGN, Ill. — Forro music, originating in northeastern Brazil, is both a well-known dance music evoking images of the rural countryside and a protest music intimately tied to the landscape and the hardship caused by drought. University of Illinois music professor Michael Silvers – an ethnomusicologist who specializes in the music of Brazil – looks at the connections between forro music and nature and how both are affected by power and politics in his new book “The Voices of Drought: The Politics of Music and Environment in Northeastern Brazil,” published by the University of Illinois Press. 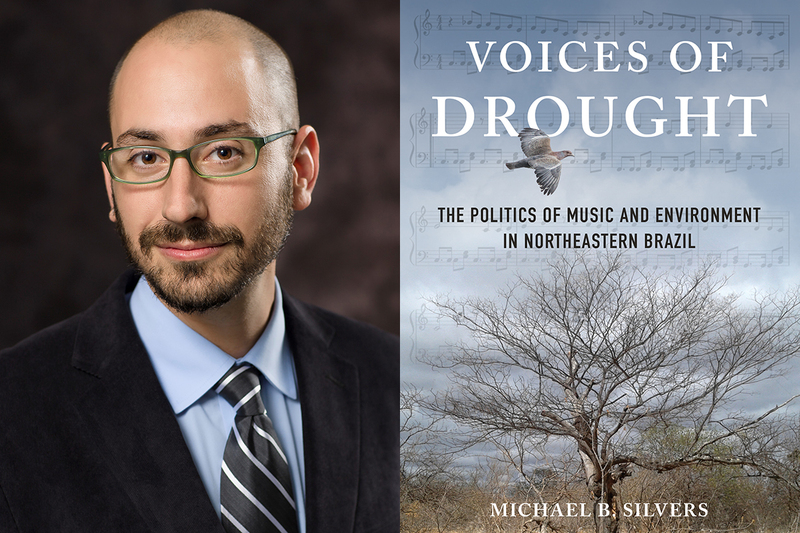 Silvers is a scholar in the new multidisciplinary field of ecomusicology, exploring the relationships between music, culture and nature. Much of what is written about northeastern Brazil concerns drought and its social and economic implications for the region, Silvers said, and forro music is no different. “Drought is all over the lyrics of this music. Most of the best-known songs talk about the landscape and the experience of drought exile and of being a drought refugee,” he said. His book is a series of case studies, each exploring how forro music answers questions about music’s relationship to the environment. He argues that answers to these questions can be located in matters of power, inequality and social justice. Early forro music from the 1940s-1960s has been characterized as kitschy dance music, but Silvers argues that much of it was protest music. Musicians sang about the drought and many of the songs were directed at the government, asking for help in the form of loans, drought-proof employment and public works. “It was not just asking for rain and lamenting the migration to the city. There also are some really specific and direct appeals for help,” Silvers said. Silvers looks at the relationship between natural resources and the making of music and musical instruments, and the effect of environmental decline. He writes about carnauba wax, produced only in northeastern Brazil as a drought adaptation of the carnauba palm tree. The wax was used for wax cylinder phonographs and later for wax masters for early 78 rpm records. “It’s a story about Brazil’s economy, drought adaptation and trade with the U.S. directly related to the creation of popular music and capturing and mass producing sound,” he said. The book also chronicles the Brazilian government’s cancelation of state-funded Carnival celebrations from 2014-2016 because of the country’s economic crisis and ongoing drought. Carnival celebrations are seen by some as an inherent element of Brazilian citizenship, Silvers said, and Brazilians questioned why the government wasn’t fulfilling its responsibility to support the parties. “Here’s an example where the cost of drought has directly affected musical production,” he said. The book recounts how forro music is a way of conveying environmental knowledge. The song lyrics often relate to natural phenomena that predict the weather or the harvest. Silvers said rain prophets share predictions for the rainy season each year, and they often refer to forro music and its lyrics. “Not only does this music convey this ecological knowledge, but because the music is so closely related to regional identity, it signifies ecological knowledge itself as a source of local identity and pride,” he said. During the Workers' Party era (2003-2016), economic change and social reforms in the country created a new middle class and an emphasis on cultural programs to promote traditional music practices, but they’ve also created a context in which a pop culture version of forro has thrived. Even with the popularity of a more mainstream version of forro, the traditional form of the music is reaching broader audiences. “Today, (traditional) forro is seen as folklore, a more mythical representation of the northeast,” he said. Editor’s note: To reach Michael Silvers, email msilvers@illinois.edu.